Bunny Theme Set file. This SVG file is perfect for your cutting machine. The svg file is an easy to cut out design to make all your pages come together quickly! Here is our discounted Theme pack for you! This set includes our adorable BUNNY theme. 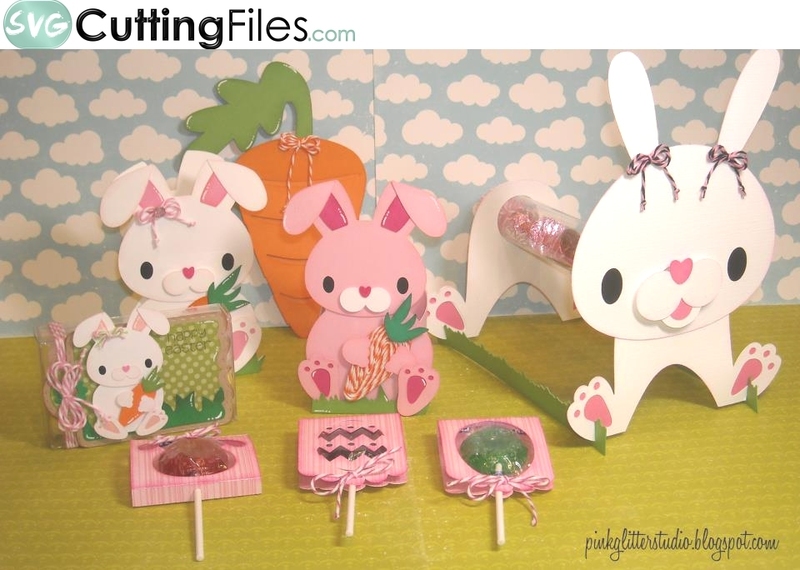 In this set you will get the Bunny Shaped Card, The Carrot Slide Card, The Easter Bunny Treat Box, the Single bunny cut file, the Easter Lollipop Pack and the Bunny Candy Tube holder.... what a great set to make your Spring Fling super fun!! *Please note, the bunny on the hang tag is for the BUNNY file only, the TAG is a DIE from Jaded Blossom.